On Golf Handicaps: Is Your Tournament Equitable? Introduction - A golf handicap is a rough measure of a player's ability. It is not a perfect measure. It is biased in favor of the low handicap player, biased against a player with a large variance in his scoring, and biased against the player whose scores are trending upward. Even with these flaws, however, it is probably the best predictor of a player's gross score in a stroke play event. Many tournaments, however, are played in a format where no scoring data is available. In a four-ball event, each player may post an individual score, but the team score is not posted. There are clearly practical problems with trying to get a team handicap for four-ball events (e.g., not sufficient scores with the same partnership). To get around this problem, studies have been undertaken to examine the relative performance of generic teams. For example, the USGA believes the teams with the higher combined handicap will do better in four-ball stroke play than teams with lower combined handicaps. To correct for this inequity, the USGA recommends each player only receive 90 percent of their course handicap (See USGA Handicap System, Sec. 9-4bii). The 90 percent figure is called an allowance. A tournament committee has a great deal of discretion in choosing the allowance for a particular format. That choice will have a large impact on the equity of the tournament. Typically, there is no ex post facto examination of equity after a tournament is completed. This lack of analysis only ensures the same mistakes will be made next year. This paper examines the equity of a tournament to provide an example of what should be done to increase equity. The exemplar was a two-day tournament with a two-man scramble and four-ball format. Thirty two teams participated and could select to play from any of three sets of tees with their handicaps adjusted according to Section 3-5 of the USGA Handicap System. Five areas of possible equity problems are studied: 1) Prize format, 2) Scramble handicap allowance, 3) Four-ball handicap allowance, 4) The effectiveness of Sec. 3-5 in ensuring fairness, and 5) The spread in the difference in handicaps between partners. A concluding section suggests possible policy and research implications for the United States Golf Association (USGA). The argument for “equal gross and net” is the low-handicap player cannot compete against the high-handicap player in a net tournament. This argument may be valid when there a large number of players and a wide range of handicaps. Typically, a high-handicap player has a larger variance in his scoring so it is likely one of the high-handicappers has a good chance of winning—as well as finishing dead last. If the competition is flighted and the range of handicaps within each flight relatively small, the argument that a low-handicap player cannot compete loses much if not all of its strength. This tournament only had one flight with handicaps ranging from 1 to 28. The low-handicap players, however, did very well. For example, the team winning low gross also had the lowest net score. The advantage of the low-handicap player stemmed an inequitable handicap allowance formula which is discussed next. Scramble Handicap Allowance – In the scramble event, the player with the lower course handicap was allowed 25 percent of his course handicap. The player with the higher course handicap was allowed 15 percent of his course handicap. The total was rounded off with fractions of .5 or more rounded up. This allocation seems inequitable on its face. A team of ten-handicap players would receive a handicap of 4. A team of scratch players would receive a handicap of 0. In essence, the ten-handicaps would have to play even with the scratch players over 14 holes and just lose by a stroke on 4 others just to tie. This seems unlikely. In an ideal tournament, net scores should not be correlated with handicaps. Fig.1 shows a plot of the net scores versus the scramble handicap of each team. 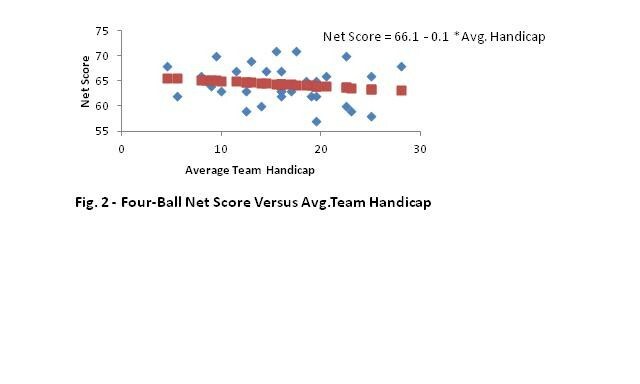 Net scores and handicaps are highly correlated (R2 = .54). The linear regression equation predicts that for each one-stroke increase in team handicap, the net score will increase by 1.3 strokes. This explains why the lowest net scores were posted by the three teams with the lowest combined indices. Clearly, the 25,15 allocation was unfair to the high handicap players. Is there a more equitable allocation? That is, is there an allocation that reduces the slope of the regression line to near zero? The USGA suggests a 35,15 allocation. Using the USGA allocation, the estimate of the slope was reduced to 0.8 for the full sample as shown in Table 1. Based on this data set, the “best” allocation would be 50,25. This allocation produces a minimal slope (.2)and the R2 value indicates a team’s handicap only accounts for 14 percent of the variance in net scores. Because of the small sample size, however, this result only suggests the USGA recommended allocations may be too low and further study is definitely needed. Four-Ball Allowance – The net scores of each team are plotted against their average team handicap in Figure 2. The regression equation indicates average handicap may have a small negative effect (-.1 for every increase in average handicap) on net score. If there is a wide range in average handicaps, however, even a small effect could be important. In this tournament there was a 20 stroke difference in handicap between the low-handicap and high handicap teams. This translates (20 x .1) into a 2 stroke edge for the high handicap team. Handicaps, however, were not reduced by 10 percent as recommended by the USGA. 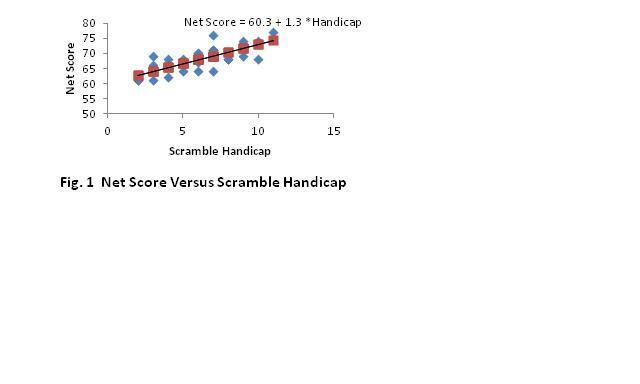 If they were, it is likely the effect of average handicap on net score would disappear. The coefficient for the average handicap variable, however, was not significant at the 95 percent level of confidence. The finding of bias found here is merely suggestive, and a more definitive conclusion waits upon more and larger samples. Sec. 3-5 – In this tournament, teams were allowed to complete from any of three sets of tees. The player’s handicaps were adjusted in accordance with Sec. 3-5. The assumption was the particular set of tees chosen would not have an effect on the team’s net score. This assumption is examined for the scramble and four-ball competitions. The coefficient of the T variable was not significant (t-statistic = -0.17). This would indicate Sec. 3-5 adequately compensates for the differences in tees. The equation estimates that playing the longer tees results in a 1.6 stroke increase in the teams net score. Again, the coefficient of the T variable was not significant (t-statistic = 0.93) at the 95 percent level of confidence. The equation does suggest, however, that Sec. 3-5 has not equalized competition in the four-ball event. The coefficient for LH was not significant as before. The coefficient for the T variable was slightly more significant (t statistic = 1.24), but still did not pass the 95 percent level of confidence. The coefficient for the Spread variable was significant at the 95 percent level (t-statistic = -2.18). This confirms the USGA’s recommendation of placing a limit on the difference in handicaps between partners. The coefficients of the T and Spread variable were not significant (t-statistic = -.2 and -.1 respectively). This would indicate the limitation on the difference in handicap between partners may not be necessary for scramble events. Given the peculiar nature of this tournament (the use of difference tees and a biased handicap allowance), any finding from the scramble event is not much more than conjecture. Implications for future Research - The limited purpose of this paper was to demonstrate a methodology for evaluating the equity of golf tournaments. In the course of this research, however, several policy and research questions surfaced that should be addressed by the USGA. · The USGA requires clubs to use Sec. 3-5 when players are competing from different tees. The USGA, however, has not reported any research that proves Sec. 3-5 provides for equitable competition for different formats. This should be corrected. Moreover, the USGA should provide guidance on when Sec. 3-5 should be used and when it should be avoided if possible. The USGA published "How to Conduct a Competition," but it is of little help in selecting formats to help ensure equity or in analysing tournament results. · The four-ball allowance recommended by the USGA was developed around 1978. That was 34 years ago. It seems time to revisit the allowance since there have been changes to the handicap system since then. · The USGA only gives a soft recommendation on the allowance for scramble events—i.e., 35,15 seems to work, but you can use anything you want. The USGA could instruct handicap chairpersons on ways to evaluate the equity of tournaments, as done here, so they are in a better position to select the appropriate allowances.